One of my unplanned goals for last year was to sort out my writing habit: to get the point where I was writing regularly and, most importantly, making time to do that writing. Going into this year I made the very conscious decision to develop a structured workflow and apply that to my writing projects. I spent a lot of last year, and probably year before that, dabbling in various productivity apps and half-heartedly trying to use them to help take some of the workload off my writing. Part of the reason none of them ever worked for me was that I didn’t have enough of a writing routine to make any planning tool truly effective. There’s no point scheduling a bunch of writing for next week when you’ve got absolutely no idea if you’re going to end up having any time to write in that week or not. I realised that not sticking with the plan was the biggest mistake, rather than assuming that the plan itself was flawed. Once those pennies dropped I realised the main thing was just to come up with a reasonable workflow, using tools that I was already familiar with, and stick to it. And here it is. Pretty simple. There’ll be some additional blog posts going into further detail about how I used Evernote and Trello, but keep scrolling down for the overview. One of the key things for me in finalising this workflow was deciding which was the right tool for which task (I’ve added a bit at the bottom of this post about why I chose each tool). Another critical factor was applying the GTD principle of getting things out of your headspace as quickly as possible (hence the first two steps). Anyway, a little bit more about each of the steps. Previously, writing notes has perhaps been one of my biggest failings as a writer. I keep everything in my head and occasionally write a brief outline here, or a few character notes there. It means my head gets very crowded at times. It also means that I’ll inevitably forget some potentially great ideas from time to time. I’m not the sort of person who copes well with a miscellany of notes jotted down across various notebooks and online tools, so nailing this stage was probably the most critical part for me. As per the above, I’ve never been that organised in gathering my ideas together. Some of my outlines went in Evernote, some would go in Google Docs. Some would be in a document simply titled ‘Ideas’ and some would be granted the privilege of their own document. Typically this would mean that an idea I had a year ago and decided to revisit would never be where I expected, or I’d find an older version, not realising I’d worked on it since. This step means that I’ll always know where to go when I want to add something to a story outline, or other note. Up until now I’ve used Google Docs (and occasionally Evernote) for plotting my stories. I do a bullet point outline, occasionally add some character notes, and then I start writing my story at the top of that same document. (Remember that most of the ideas would still be in my head at this point). it’s fine for short stories, but is never going to work for longer pieces. I like the idea of using an index-card style method for plotting longer piece (being able to drag, drop and move around scenes without laborious copy and pasting) but I also like to be able to read a linear outline too. Plotting in Trello (which uses cards) and then transferring that to Evernote checks both those boxes. Not everyone wants to publish their work, and that’s fine. However, you should always have a final step in mind, whether it’s submitting to a publishing, self-publishing, or simply hitting Save & Close. Otherwise you’ll just keep writing and writing, and tweaking and tweaking, and you’ll never move onto the next thing. Before I go any further let me note that there are some applications that’ll handle most of this workflow single-handed, Scrivener being one excellent example. However, there’s one, big reason why I don’t use Scrivener (yet): I need to be able to write and edit on my iPad, my PC and my work PC. Whatever tools I use have to be available and accessible across all three devices – and particularly on my iPad, which is what I use for most of my writing. As Scrivener doesn’t yet have an iPad app it’s of no use to me. For now. I do most of my writing on my iPad using Google Docs. It’s no frills and gets the job done, and it’s available across all devices. It also means I don’t need to worry about a hard drive failure wiping out my work (yes, it does sync to my desktop as well and, yes, I do always keep a copy of finished stories. No, I’m not really that worried about anyone hacking into my account). Not much more to say there. 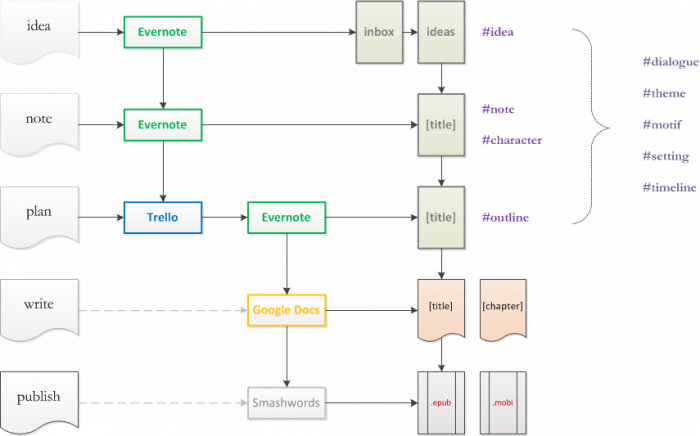 Evernote is something I’ve read lots about and never quite got the hang of. I initially made the mistake of using it as a writing tool (it’s not as straightforward as Google Docs) and went off it because of that. I was also turned off by the inconsistencies between the interface across the web, desktop and mobile versions. Given its relative simplicity, flexibility, and the ability to use tagging to organise notes I’ve made the decision to use it as a collector for my notes and ideas, and I’m finally starting to get Evernote. For getting ideas down really quickly I use the Squarespace Note app on my phone: it opens directly onto a blank page, and you simply need to swipe to send what you’ve written to Evernote. Obviously I can also use the various Evernote apps themselves to organise everything at a later date. Trello is another tool I really like and have struggled to find a clear use for. It’s incredibly flexible, which is part of the problem and also one of its biggest assets. I’ve settle on using it for planning and structuring (which, to be fair, is what it’s designed for), and that’s exactly where it fits in my workflow. At the moment I’m using it to layout timelines and plot structure for a forthcoming novel, as well as to manage a task list for a forthcoming short story collection. You can also check out how I use Trello for organising blog posts. Hopefully this is useful to some of you out there. Please use the comments if you have any questions, or if you want to share your own workflow tips.